Can tornado warning apps be helpful? If the behavior of tropical cyclones – giant formations that form in days and weeks – is relatively easy to predict, tornadoes – forming in a few minutes, at the junction of air masses of different temperatures – are too sudden. Therefore, all the variety of tools and methods involved by scientists today is devoted to a single task: to ensure the collection of real-time information about the state of the atmosphere in a potentially dangerous area. For our part, we offer you an overview of applications that have a warning function of an oncoming tornado. 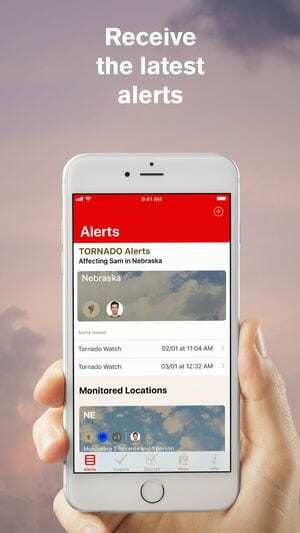 American Red Cross is the most popular tornado alert application which will help you survive a tornado. 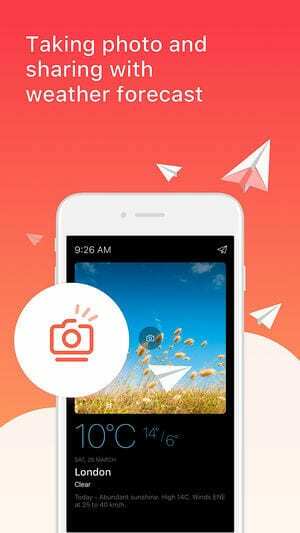 This free application is available for iPhone and Android owners. Here you will find current information from the National Oceanic and Atmospheric Administration, as well as communicate with relatives and friends. With this application, you will hear an audible siren when NOAA issues a Tornado warning. You can monitor several places that matter to you. So, it will be possible to warn distant friends and relatives too. You can track hazards on the live map. There are also step-by-step instructions (right before, during and after) and recovery tips. Another useful feature of the app is “I’m Safe” notification sharable via social networks, text message, or email. Your relatives will know that you’re safe. 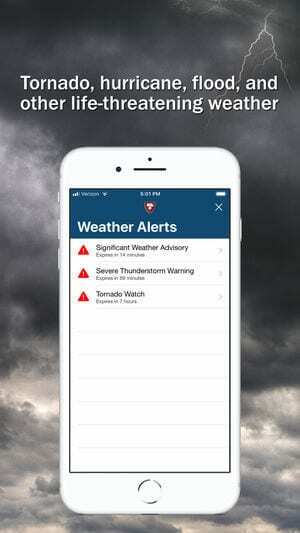 My Hurricane Tracker is a free application that allows getting alerts about tornados and other severe weather conditions. Convenient and simple application with detailed information, interactive tracking maps and push notifications. You can track specific hurricanes and receive notifications every time they are updated just by pressing the notify button! 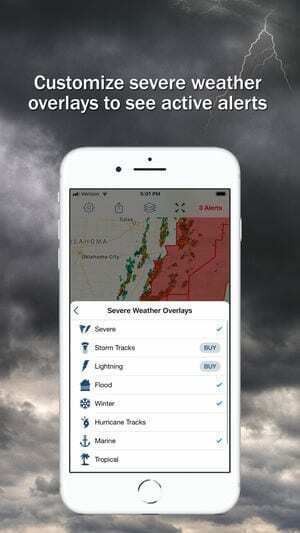 Storm Radar: Weather Tracker – convenient and feature-rich software for Android and iPhone devices, providing a detailed and accurate weather forecast in the United States. You will get a detailed map with weather data for the next 8 hours. So, start tracking the foci of storms and thunderstorms and get notifications online. Get up-to-date information about the weather at your location or learn about events on any part of the planet in the past 6 hours. Here is a function “Track the Storm” and find out what time the storm comes, how strong and long it will be, whether it will be with wind, hail or tornado. You will be able to clarify the data on tropical hurricanes, their speed and estimated time of occurrence. Learn about thunderstorms in America within a radius of up to a hundred miles from a location. Get a detailed forecast report at any point on the planet in just a few taps. Wonderful program Storm Radar: Weather Tracker independently determines your location. This is done using GPS. If it’s missing, you can manually specify the location. The interface is comfortable, so you quickly and easily understand the functionality of the application. Storm Shield application allows you to get severe weather warnings via voice and push notifications anywhere in the USA. Get alerts for tornado, hurricane, flood, thunderstorm, winter storms and other life-threatening weather events for your current location. You will quickly see what’s going on at your locations right on your home screen with Hi-Def radar map. It provides accurate information about current conditions, hourly and daily forecasts. It’s possible to add several locations in order to ensure family members stay safe. Today Weather – Forecast, Radar and Severe Alert provides the most accurate weather forecasts in your city through a beautiful and simple interface. The main feature of the application is a clear forecast based on location. Thousands of beautiful photos that accompany different weather situations and time of day are realized here. The application displays accurate hourly forecasts, which are accompanied by the probability of precipitation, wind speed and direction, air humidity and other weather parameters. The built-in data sharing function allows you to create and share custom images of forecasts on social networks. A multifunctional home screen widget will allow you to track changes in the weather without opening the app as well as get a storm or tornado warning alerts. Also, you can always set up a notification that notifies you of weather changes of the specified type in the specified region. To get a more detailed forecast, just swipe down. Swipe from left to right allows you to change geolocation. If you haven’t still chosen a tornado alert app for yourself, take a closer look at The Weather Network application. The Weather Network provides an accurate weather forecast at any time, as well as the latest news and videos about the weather outside the window. Here you will find the most accurate and relevant forecasts with a detailed description of various aspects of the weather. Customizable notifications will keep you up to date on storm warnings at specified locations, and the function of viewing satellite maps combined with meteorological radar maps will help you globally view the weather. The application contains accurate weather forecasts for the current moment, the next 36 hours and 14 days. Weather data is updated every 15 minutes through various meteorological centers, which ensures the reliability of the forecast. The application has its own weather map, where you can see the oncoming thunderstorms and cities affected by bad weather (marked with a red banner, clicking on which you will open additional information). The schedule of precipitation changes every 10 minutes – the tornado will no longer come as a surprise to you. To get the weather forecast, the latest news and videos, simply scroll down the main menu of the application. The blue button is designed to display additional information along with the current forecast (maximum and minimum temperature, humidity, wind speed and direction, precipitation, sunrise and sunset times). Through the icon in the upper left corner, you can open a list with all available data, application settings, and frequently asked questions. To add a new location to display the weather, simply touch the name of the city. Download AccuWeather and find out the current weather forecast for your geographic location and use all the free features of the application for free! Per minute forecast of precipitation for the coming two hours are available on your smartphone. You will know, for example, the type of rain, its intensity, the time of the beginning of the rain and the time of the end. Before the snow, rain, wind, probability of thunderstorms, tornado, and ice, the utility will show an orange map, which will display current weather conditions with a warning of the level of danger. Receive push notifications about the unpleasant weather conditions in the United States. The program is connected to satellite radars around the world, watch the forecast video in English and Spanish languages. The application updates the information every 15 minutes and gives an accurate forecast for 15 days, taking into account humidity, an intensity of UV rays, wind speed, intensity of precipitation, dew point, etc. Be aware of local weather reports, with a description of the forecast for the next 5 days. The application works in 12 or 24-hour mode, in metric or imperial units. NOAA Weather Radar Live displays a weather map in the form of radar or satellite. It determines the temperature outside your home window at different times of the day. You can add the required places to your favorites. You can choose the types of warnings about the storm, flood and wave height, snowfall, frost, cyclones, tornadoes, and other phenomena. Customizable notification of adverse weather conditions. WeatherBug transmits accurate weather forecasts from professional meteorological stations. The free software provides timely warnings of bad weather, shows weather in real time and hourly forecasts for 7 or 10 days. Use the radar, satellite, lightning alerts, or find out the temperature outside the window, humidity or UV index. Join the millions of users who have chosen WeatherBug, get warnings of danger and get ready for serious natural challenges. The system uses data from meteorological towers in North America that report on environmental conditions in real time. Use two dozen animated maps where you can look at the weather at the desired point in detail. 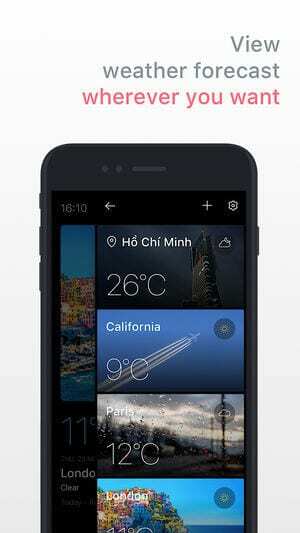 Find any point on the planet and find out where the weather conditions in one touch. Manage the application according to your preferences –set icons and displayed data. If necessary, you can disable any unnecessary features. The application offers notifications about the storm and strong wind, and also tells about the current conditions for local and saved locations. Get a detailed hourly forecast or read about the forecast for 10 days in advance. In a few taps, you’ll be able to find out everything about wind speed, pressure, and other meteorological indicators. Add cool widgets to your device’s main screen or enter a hurricane tracking center — use satellite to get data about past or upcoming hurricane. Radar Weather Map & Strom Tracker – an indispensable thing for all motorists and travelers. The app works great in offline mode and gives a lot of information about everything you need to know on the go. In fact, this is not even an application, but a full-fledged widget that shows you the weather in real time. The application synchronizes with the server when there is Internet access and loads the forecast for the next few days from there, after which it is able to show it offline. The widget itself looks simply luxurious – with a big clock, beautiful animation, and juicy backgrounds. There are almost 150 different themes to choose from, so you can customize the look of the application. 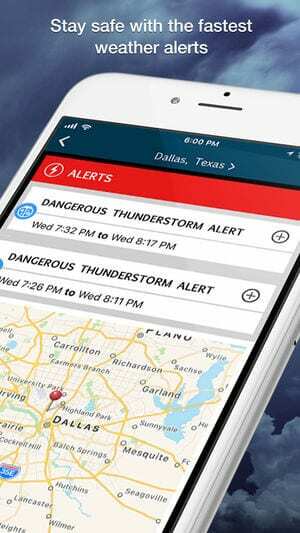 With this app, you will get real-time weather alerts and weather warnings. Rain, storm thunder, tornado and lightning alerts will be received as weather notifications. In general, the widget is extremely multifunctional – it seems that everything in the settings changes and adjusts here – from the frequency of updates to the appearance. So if you wish, you can completely customize the widget to suit your biorhythms. The Weather Channel – a useful and colorful application will help you to always be aware of the weather conditions, wherever you are. The Weather Channel will always let you know the current and most accurate weather forecast. The animated main screen of the program will vary depending on the time of day, weather conditions and location. Displaying information about temperature is possible in several ways: show a long-term forecast for 15 days or a detailed hourly one. The application also shows the direction and speed of wind, pressure, humidity, dew point, level of visibility in the atmosphere, UV index, time of sunrise and sunset. Information that you don’t want to see constantly is easily disabled in the settings. The program has several customizable widgets that are displayed on the main screen of a smartphone or tablet. A widget can be either detailed, but taking up a lot of space, or compact, containing only the most important information for you. The Weather Channel will send you alerts about sudden precipitation and tornado warnings. Now, no vagaries of weather can take you by surprise.